Thank goodness for that lid. If I choose not to lift it, I don’t need to know what’s sliced through our letter box. I expect you’re one of those people whose heart lifts when the arrival of the morning post reassures you that you haven’t been forgotten. Someone out there is thinking of you, even if it’s only the gas company. Me – I’m not like that. For me, there’s nothing to look forward to when I dare to lift that lid. There may be things to dread. No – you’ve guessed it. I don’t write letters. I forget birthdays. For me, it’s text, email or nothing. The phone? Even that might be unsettling. I feel I can never quite trust the disembodied voice, even when I recognise it. There’s still so much that can be hidden, isn’t there? And secrets scare me. The post hadn’t yet been delivered when I left for work this morning. I got home about an hour ago – since when I’ve been sitting at the kitchen table, the evening deepening around me, the cup of Oolong tea I made for myself growing cold beside me. I thought a soothing hot drink would be a useful prop for the letter-opening ritual. I’d managed to lift the lid, and found the box uncharacteristically full. I’d felt my guts plunge. The house was quiet and still. Matt wouldn’t be back from the office for a bit; Stella was staying the night at Claire’s, after some grim-sounding trick-or-treat party that I can’t approve of but would prefer not to veto. Josh must be out, as the house wasn’t juddering to the drum-din of his music. Probably at the gym. Recently he’s become obsessional about his physique. Cherchez la femme, as they say. So here was the perfect opportunity to get the ordeal over and done with. I inhaled the sweet, exotic fragrance of Oolong from my whale mug, registered the steam condensing on my face. But it was too hot to drink. So I put the mug back on the table and sifted the unopened envelopes into a pile, the least interesting on top. How tediously predictable: what looked like an electricity bill; something from the bank that wouldn’t be pleasant; a plea for a charitable donation; something unidentifiable but boring-looking (I would deal with that one first); and there, already lurking in its rightful place at the bottom of the pack… the only interesting player. I picked up the envelope. It might be fun to hazard a guess as to its contents. Square, dead white, with a first-class stamp and a Chelmsford postmark, it yielded few clues. But it was strange: whoever had sent this – and it was a real person, for the direction was hand-written – clearly doesn’t know me well – or is pretending not to. They’d managed to get my name and address slightly wrong. Yes – my name even! I’d prefer not to go into the details: it’s something I’m actually quite sensitive about. I considered the handwriting once more. How can you tell when someone’s trying to disguise their paw-print? I don’t know – but to me, as I took in the painfully neat, almost childlike script, it seemed obvious. Whoever it was had evidently gone to the trouble of using a nice quality pen. Trouble, in fact, was written (as it were) all over the envelope – even the bits that weren’t quite correct. I slipped the unexploded missile to its place at the bottom of the pile. The other mysterious (but boring-looking) one turned out to be a local estate agent encouraging us to sell the house. ‘We have a client seeking to purchase a property similar to yours.’ I lingered for a minute before starting a recycling silo. A good price for number 79 might, after all, solve a few problems. But I threw it to one side, and then wondered if this had been a mistake when I opened the letter from the bank. The usual one about going beyond our overdraft limit and so incurring charges. I knocked back a quick slug of tea – but it was still too hot. Tongue sizzling, I took on the electricity bill, only to find that it wasn’t exactly a bill but a scolding communication in the all too familiar red font: we’d failed to pay the one sent to us three weeks ago. Why am I always left to deal with these things? The one from Greenpeace I opened only to separate letter from window envelope. But realising that Greenpeace must after all have an eco-friendly window, I pitched them both onto the recycling. Of such minutiae is my life composed. And so there it sat, my final piece of post, white and still, on the kitchen table, waiting. I made a lunge for it; tore it open; felt a sharp sting as I registered the paper cut I’d given myself; sucked at a drop of blood. And a blood smear at the envelope’s jagged edge. I pulled a tissue from my sleeve, pressed it into the cut and counted down from thirty. Zero. From the envelope I pincered a greetings card. On thick card, an embossed picture of a flower had sprouted. Its petals were pink. What are those inner petals called? Sepals? On this flower they were cream-coloured, and they sparkled up at me. And, beyond these, its innards were exposed – a clock or wheel with green glitter glue at its heart. A purple butterfly, its wings edged with silver sparkles, had been caught between flutters and hung there, curiously stilled, above the flower. Its antennae had a predatory look, I thought. The flower’s stem bore four leaves bristling with patterns and, on one of them, upside down, as though accidentally transferred from a piece of newspaper that had stuck to it, the words ‘than from’. It wasn’t surprising, really, that the artist had chosen this little feature, for there certainly had been plenty of sticking. Even the word that was the card’s single message was spread with glitter glue: in the glow of the kitchen’s ceiling lights the word winked at me. It was trying to dazzle me. The second ‘r’ had hooked itself over the ‘y’. Got you! Whoops - sorry. I found myself blinking for a second before opening the card to its inside page. My first reaction, I confess, was to laugh out loud. Silly cow. Yes, it was obviously written by a woman. Some ridiculous fantasist, puffed up with a sense of her own importance. No full stop at the end; that presumptuous kiss; the fake grovelling suggested by the word ‘humbly’. ‘Humbly’ indeed! It simply conjured up, once again, an ego on overdrive. And, talking of fake… The handwriting of the message, like that on the envelope, was evidently contrived: childlike, impossibly consistent, the dark-blue fountain-pen script fixed perfectly into the middle of the page. I turned to the back of the card. No clues. Just the names of the manufacturer and designer, and another sparkly butterfly, more pink than purple. How feminine; how repulsively sentimental. Propping the card up on the table, I reached for my whale mug and closed my eyes as I sipped. The temperature was now perfect. I inhaled once again. Who on earth, I asked myself, would send me a message like that? Who had reason to? I could think of no-one. I couldn’t even think of a friend or acquaintance who would choose such a soppy, tasteless card. ‘I am so sorry for the hurt I caused you.’ What hurt? I feel no hurt. No-one has caused me pain. Well, if they intended to, they didn’t succeed, for it’s not biting. It never did. Warming my hands around the mug of tea, I reminded myself how lucky I am. Yes, I know I moan and snap and nag. That’s what my children tell me I do. I know kind, patient Matt finds me frighteningly unpredictable. But I am aware of my good fortune, on the whole. On the whole. I sighed, remembering the wagging fingers of the bank and the electrics, sensing the grumbles of my weary mind and body after yet another day of underpaid work. But of one thing I was certain: the silly sentimental cow didn’t need to apologise for anything she might have done with Matt. He is the most loyal, the most biddable of husbands. Swiftly, I downed the remaining tea and, leaving everything on the kitchen table, moved across to the sitting room. I didn’t bother to put the lights on; just walked over to the table, my nose guiding me. Amazing, really, that they can grow narcissi in the autumn. I saw their white heads gleam in the half dark. I buried myself in their scent, careless of pollen. I concentrated on the inhalation, then stood back and breathed out deeply. There. Matt gave them to me yesterday – a congratulations present for that small triumph of mine at work. I could see from the wrapper that he’d bought them from a pricy florist. Silly boy. I felt myself break into a smile. Now these flowers were real; their fragrance was heady and sweet. Unlike that silly pink imitation, its head the ‘o’ of a meaningless word, its leaf on either side making it look like a dancer from an amateur waltz of the flowers. I’d studied it so closely I could picture the image quite clearly when I closed my eyes. But I did wonder whether, if I went back to it and rubbed it, an artificial scent would waft up to clobber my nostrils. Something bothered me, however. I went back to the kitchen and – carefully, as though it might be hot – lifted the card to inspect its message once more. ‘I most humbly ask for your forgiveness…’ Opening the dishwasher and placing the whale mug next to its polar bear partner, I found myself baffled. How can you forgive someone when you don’t know who they are? I told you she was a silly cow. ‘I… understand if this is not possible.’ Woman, you are wallowing in your sense of guilt. You’re positively enjoying it. That’s why you don’t actually want to be forgiven. Of course it’s not possible to forgive you. Who the hell are you? Shoving paper into the recycling bin and everything else into dissolution’s dark maw, I told myself to make the most of everyone’s absence and put the wash on. I tackled Stella’s room first. She’s a tidy child – you could say worryingly tidy for a twelve year old, and I found all her dirty washing consigned dutifully to the linen basket. Bedroom and clothes were haunted by the ghost of some cheap perfume Claire gave her for her birthday. Everything smelt as pink as that fake flower on the card. Josh’s room smelt of sixteen-year-old male sweat. Boxers, T shirt, hoodie and three socks formed a sprawling inside-out path across the floor. I heard myself sigh as I gathered them up. ‘Humbly’? There was, surely, a sneering arrogance in begging for forgiveness while remaining stubbornly anonymous. The more I thought about her, the less I liked her. Indeed I liked her even less when, collecting the laundry from our bedroom, I found myself opening the wardrobe and going through the pockets of every single pair of trousers and every jacket Matt had hanging there. Loose change, unwanted business cards, an out-of-date debit card, some special offer at Boots (what is it about middle-aged men and Boots? I watch them prowling around the branch at Waterloo Station and conjure up that witty moniker – ‘the worried well’)… Ah, so that’s where the spare car keys got to! But no scribbled-down phone number, no secret little snapshots, no billets doux. I mean – I hadn’t expected to find any, of course. That’s why I was so angry with Ms. Sorry for making me undertake such a squalid little search. Angry with myself too, for succumbing to the cliché. 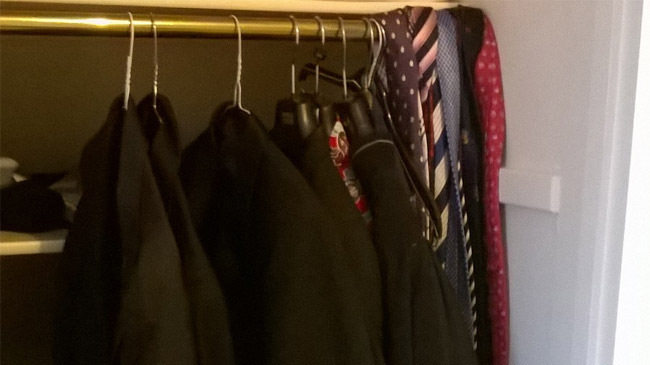 As I made to slide the wardrobe door shut, a tie fell from the rail. Bending to retrieve it, I recognised it as the teddy bear sprinkled tat his secretary gave him for Christmas. For a minute, I paused, picturing the piggy eyes and double chin of Bev Walker. No. Impossible. I slid the door shut. So she definitely wasn’t sorry about anything she’d done with Matt. Mind you, the woman’s clearly a fantasist, and my husband undoubtedly good-looking. I pride myself on being partnered to such a handsome man. Maybe I’m the one who should be feeling sorry – sorry for her: she longs to have an affair with my husband. She’d love to send him a tacky card. So she sends one to me instead. I heard the front door bang. Only one member of the family lets it make that much noise. Decanting all the laundry into our basket, I gathered up my burden and met Josh on the staircase. He gave a deep sniff and brushed his sleeve across his face. His dark eyes were wide from exertion. Such beautiful eyes. Beneath the beany, his hair was still wet – from a shower, I hoped. ‘Give me two. I’ll get changed and then you can put this stuff in as well.’ He plucked at his sweat shirt. ‘And you can take this.’ Removing and unzipping his backpack, he dropped a damp towel into the basket. It was pink and flowery. His response was to close his bedroom door behind him. I suppose he didn’t hear me. Later, when Matt was home from work and helping himself to a beer (it wasn’t until Stella started at nursery that I worked out why he’d suggested that name for her), I showed him the card. ‘A bit creepy really.’ Matt swung back on the chair, card still open between finger and thumb. His brow furrowed. The chair lunged forward once more, grating rather horribly on the tiled floor. ‘You know…’ He paused, and knocked back almost half a glass. I thought it might help if I settled down next to him. So, making do with the wobbly chair, I leaned my elbows on the table, put on my attentive wifey expression and tracked the bulge in his throat. Immediately I was aware that two swift reactions sprouted inside me. One was irritation that Matt had, perhaps, got there before me. The other – and this thought started to grow like some dull flower in my heart – was that I actually didn’t want to know who sent it. I didn’t want to have to put a face to this person who had, apparently, done me wrong. ‘Well remembered.’ I shot him a quick glance, but he didn’t catch my eye, his snout being buried once more in his beer. Let me explain. Alan Groves is Matt’s boss. He manages the department, and I’m not sure I trust him. He’s been promising Matt for some time now that he’s going to be promoted to assistant manager. But that simply hasn’t happened. Goodness knows why. Call me biased, but Matt would do the job brilliantly. I know it. ‘So why would Myra… sorry – Moira… believe she needs to say sorry to me?’ I shunted the wobbly chair towards him, wincing once more at that grating sounds, and put an arm round him, placing my hand under his jacket and shirt so that I could massage the naked back beneath. I have nice warm hands, and he always likes it when I stroke his skin like that. Matt put down his glass and, leaning back, grabbed my hand. He held it still. ‘Don’t worry, Ros. She’s at least ten years older than me and not my type.’ Again, he paused. ‘But she’s a determined woman; a very determined woman.’ He started to nod his head, but suddenly he was shaking it instead. Then, releasing my hand, he pushed his beer away and rested his arms on the table. He bent his head forward, burrowed it into his arms. He didn’t intend to reply. Mrs. Groves had, I noticed, swiftly become Moira as her image took shape before us. I couldn’t, to be honest, remember a great deal about her looks, except that the purple-red of her hair drained all remaining colour from her pale skin, and her black-framed glasses were too large for her rather puny face. A high-pitched whine, like a mosquito’s – that’s what her voice made me think of, if I thought of it at all. ‘There is no secret,’ he mumbled. Now it was my turn to be impatient. And I found myself growing angry too – though I tried to hide it, as I could tell he was upset. I noticed him squeezing his eyes tight for a second: that’s always a sign. But he’d been keeping things from me. There was no doubt about that – and it could have enraged me, if I hadn’t been (though I say it myself) such a self-controlled person. I’m afraid I couldn’t help snorting at that one. All that the faintly ridiculous name brought to mind was a young woman who looked not much older than Josh and whose skirt was provocatively short. I’d encountered her at the staff-and-plus-ones Christmas party. She rushed into the ladies’ loo where I was ‘freshening up’ (as they say these days) at the end of the evening. Even the vociferous hand dryer couldn’t muffle the sound of Kyley Price throwing up. Actually, I realised she hadn’t had time to shut the cubicle door. I didn’t ask her if she was OK. She evidently wasn’t. I reached out to touch him. For a second, it seemed, he recoiled. But then he took my hand and, very gently, cupped it with his, just as I’d done earlier to him. Our hands still lay clasped on the table, and we were talking together in little more than a whisper, an intimate whisper. ‘But clichés are usually right. And you, my beautiful wife, are always right.’ He bent down and kissed my hair. In the ensuing silence, Moira Groves and Kyley Whatsit still floated about somewhere. But I fancied they were beginning to fade. ‘So there you are. I think it was Kyley Price who sent that card. Not Moira.’ Matt uttered a kind of grunt which may have been intended as a laugh. ‘That’s what she’s doing these days when she stays on late at the office.’ The card was lying closed on the table, and he tapped the butterfly, as though trying to pin it to a board. Then, re-folding them, I slipped the ‘Sorry’ card inside them. I didn’t want to see it any more. I suppose whoever sent it – pale Mrs. Groves, Kyley the Skirt, or some other fantasist – had triumphed. She had sown a seed that might carry on growing. I must keep it out of the light, I told myself. I went over to the oven and bent down. ‘That’s it.’ I donned my oven gloves and withdrew the casserole dish. From it I could smell the pulse of success. I lifted the lid. I ladled the beef stew onto Matt’s plate, rummaging around for the mushrooms that are his favourite. I needed another light on. Tomorrow evening, the clocks go back.